PaperFlora is a boutique paper floral shop, creating unique, custom-made blooms to make an impact at your wedding, event or in your home decor. With a vibrant range of colors on the finest quality paper to choose from you can create an impressive focal point to brighten any event. Due to the high demand for custom orders, I am booked 4-6 weeks in advance. If this fits into your events timeline, please let me know, and we can discuss color options. Allow ample time before you need the flowers. I receive orders daily which pushes out production time and shipping dates. 🌸 The flowers are backed by a sturdy board for display. 🌸 The blooms are packed with care and are shipped in large boxes. They arrive fully assembled and ready for you to install. 🌸 These paper flowers offer variety in bloom type and stand out from all the others. They are stunning and will make your event magical. 🌸 DIY templates are available for you to make your flowers and include a step by step video tutorial. to see new styles, inspiration, and promotions! Love it so much! 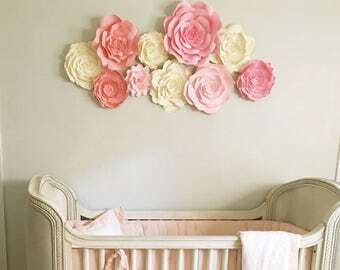 It’s a perfect match to our linens and such a cheerful feminine addition to our nursery! We adore it! Available in pink and white or ivory, this is one of our most popular sets. PaperFlora, is a boutique paper floral designer, creating unique, custom-made blooms to make an impact at your wedding, event or in your home decor. With a vibrant range of colors in the finest quality paper to choose from, along with optional wire back for easy installation, you can create an unforgettable focal point to brighten any event or home decor. 🌸The flowers are backed with a sturdy board for professional looking displays. 🌸The blooms are packed with care and are shipped in large boxes. They arrive fully assembled and ready for you to install. 🌸These paper flowers offer variety in bloom type and stand out from all the others. They are stunning and will make your event magical. 🌸DIY templates are available for you to make your own flowers. New styles added weekly. Sign up for PaperFlora newsletter to receive special offers, FREE templates and other discounts only you'll get! Just click on the blue "Shop Blog" button to your right to sign up. to see new styles and giveaways that are only available there! How do I hang and install the flowers? My flowers are backed with a sturdy cardboard baking for professional installation. I suggest you use Command Strips or Velcro to attach the flowers to your wall or displays. No, all listings are for the flowers only, no walls, props or other items are included. Due to the high demand for my flowers, I am usually booked 6-8 weeks in advance. I receive orders every day which pushes the production time out. How will I receive the flower Templates? PDF templates are digital downloads that you receive immediately in your ETSY Download file to print, cut and create. SVG templates are digital downloads for CUTTING MACHINES. You must have a cutting machine. Your confirmation email includes the link to the step by step video. I will work with you with up to 3 changes to create the custom palette for your event or home decor. After that, a CUSTOM FEE of $10 will be added to your listing. Do you have Paper Flower Pre-Cut Kits? Yes, please look under the "KIT" section. Each kit contains 1 (one) flower for you to assemble. All orders must be paid in full at the time of purchase.